Dubrovnik, the pearl of the Adriatic is one of the highlights of Croatia cruise route T3. From 11:30 am to 1:30 pm, boarding time in the port of Trogir. If you arrive by your own car, you can proceed to the parking reception (as indicated in your travel documents) already from 10:00 am. Upon arrival, our staff will show you where to park and unload your car. Our serviceteam will take your luggage to the port. After embarkation, our representatives will welcome you aboard with a drink and you will meet the crew and your fellow passengers. After a lunch snack “Cast off!”. We stop in one of the bays on the island of Čiovo, where we will have our first chance to dip into the crystal-clear water of the Adriatic Sea. After having enjoyed swimming and sunbathing, we will set sail for Split, our first port of call. 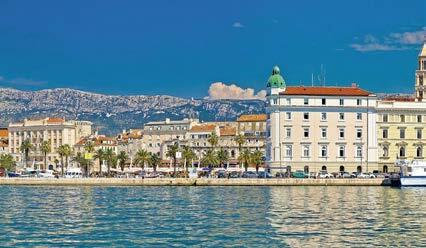 Split is Croatia’s second largest city and the capital of Dalmatia. The 1700-year-old city was once the palace of the Roman Emperor Diocletian, and is today a UNESCO-protected site. After a guided city tour, you will have the rest of the day at your disposal to discover the old town on your own and to enjoy the bustling Mediterranean atmosphere on the famous promenade of Split. For guests arriving later with a flight booked by I.D. Riva Tours – transfer to the port of Split and embarkation in the late afternoon or evening. Overnight stay in the port of Split. Sailing along the south coast of the island of Korčula, we will stop at one of the numerous bays for a swim, before heading to our next port of call – Pomena, on the island of Mljet. Part of the island was declared a National Park – two saltwater lakes (in the larger of the two lakes you will find a small island with a former monastery) are connected to the sea by a narrow channel. Do not miss the opportunity to visit the National Park (entrance fee approx. 10 €, boat ride to the monastery approx. 3 €, payable on-site). We recommend a swim in the saltwater lakes, where the temperature is always 2°C above the temperature of the sea. Overnight stay in Pomena. We leave the island of Mljet and continue our journey south. 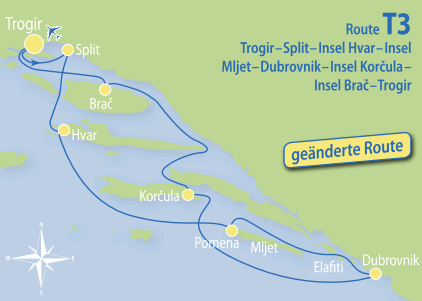 After a swimming break at the Elafiti Islands, we will enter the port of Dubrovnik around 4:00 pm. Dubrovnik is also called the “Pearl of the Adriatic”, since in the Middle Ages the city counted among the most important economic and cultural centres of the Mediterranean area. Today, the Old City unfolds a unique open air museum with countless attractions. After arriving in Dubrovnik, we are invited to enjoy a guided tour through the historic town with its impressive walls. It takes only a few minutes by bus to get to the old town. The bus stop is located right next to the port, the bus leaves every 15 minutes, last return journey around midnight. Tickets are available from the kiosk (12 Kuna per ride) or on the bus (15 Kuna per ride). After the guided city tour, you will have plenty of time to discover the gems of Dubrovnik on your own. Stroll through the famous “Stradun”, take a walk along the massive city walls and visit the numerous unique sights. Continuing our cruise in a northwestward direction, we will first stop in a bay of the Elafiti Islands for swimming and sunbathing, before heading to the island of Korčula – our today’s port of call. In antiquity, the island was also named “the Black Island”, due to its vast pine forests, which used to cover almost the entire island. Korčula boasts one of the most beautiful old towns in Dalmatia and because of its fortresslike appearance it is often called “Little Dubrovnik”. Overnight stay in the birthplace of the famous sailor and explorer Marco Polo. Passing the channel between the island of Korčula and the mountainous Pelješac Peninsula, we head towards the island of Brač. On our way to Brač, we will stop in one of the beautiful secluded bays of this area for swimming and sunbathing. The island of Brač is not only wellknown for its white limestone. Even world-famous buildings like the White House in Washington and the Reichstag building in Berlin are built with the stone, which still today is exported to countries all over the world. 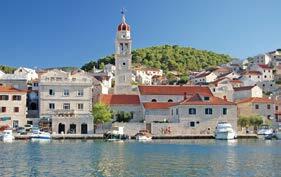 Brač is also known for being one of the largest islands in the entire Adriatic Sea. Overnight stay in one of the lovely places in the northern part of the island, Pučišća, Postira or Supetar – the perfect setting for tonight’s Captain’s Dinner. We leave the island of Brač and after a swimming break in a bay on the island of Čiovo, we will bid farewell to the Dalmatian islands and return to the starting point of our journey, Trogir, with its beautiful old town, protected by the UNESCO and also called “the Museum City”. Enjoy the experience of a guided walking tour through the winding streets and discover impressive walls, towers, churches, frescoes and vaults. Do not miss out on taking a look into the unique old yards.